2007-08-23 Assigned to PSIVIDA INC. reassignment PSIVIDA INC. ASSIGNMENT OF ASSIGNORS INTEREST (SEE DOCUMENT FOR DETAILS). Assignors: CONTROL DELIVERY SYSTEMS, INC.
2016-06-27 Assigned to PSIVIDA US, INC. reassignment PSIVIDA US, INC. CHANGE OF NAME (SEE DOCUMENT FOR DETAILS). Assignors: PSIVIDA INC.
An intraluminal medical device comprises a stent having a coating applied to at least part of an interior surface, an exterior surface, or both. The coating comprises a sustained release formulation of a combination of pharmaceutical compounds dispersed within a biologically tolerated polymer composition. The choice of the combination of pharmaceutical compounds are intended to reduce neointimal hyperplasia restenosis. This application claims the benefit of U.S. Provisional Application Nos. 60/322,428, filed Sep. 17, 2001 and 60/372,761, filed Apr. 15, 2002, the specifications of each of which are hereby incorporated by reference in their entirety. Additional advantages of the present invention will become readily apparent to those skilled in the art from the following detailed description, and the appended drawings wherein only a preferred embodiment of the invention is shown and described by way of illustration of the best mode contemplated for carrying out the invention. As will be realized, the present invention is capable of other and different embodiments, and its several details are capable of modifications in various respects, all without departing from the scope of the present invention. Accordingly, the drawings and description are to be regarded as illustrative in nature, and not as restrictive. FIGS. 10A and 10B are graphs showing the effect of gamma irradiation and plasma treatment on drug release. Group B: with plasma treatment, with gamma irradiation. Group C: no plasma treatment, with gamma irradiation. Group D: with plasma treatment, no gamma irradiation. Group F: no plasma, no gamma irradiation. FIG. 1 shows a side plan view of a preferred elongate radially expandable tubular stent  13 having a surface coated with a sustained release drug delivery system in a non-deployed state. As shown in FIG. 1, the stent 13 has its radially outer boundaries 14A, 14B at a non-deployed state. The interior luminal surface 15, the exterior surface 16, or an entire surface of the stent 13 may be coated with a sustained release drug delivery system or comprise a sustained release drug delivery system. The interior luminal surface 15 is to contact a body fluid, such as blood in a vascular stenting procedure, while the exterior surface 16 is to contact tissue when the stent 13 is deployed to support and enlarge the biological vessel or duct. In an alternate embodiment, an optional reinforcing wire  17 that connects two or more of the adjacent members or loops of the stent structure 13 is used to lock-in and/or maintain the stent at its expanded state when a stent is deployed. This reinforcing wire 17 may be made of a Nitinol or other high-strength material. A Nitinol device is well known to have a preshape and a transition temperature for said Nitinol device to revert to its preshape. One method for treating an intraluminal tissue of a patient using a surface coated stent 13 of the present invention comprises collapsing the radially expandable tubular stent and retracting the collapsed stent from a body of a patient. The operation for collapsing a radially expandable tubular stent may be accomplished by elevating the temperature so that the reinforcing wire 17 is reversed to its straightened state or other appropriate state to cause the stent 13 to collapse for removing said stent from the body of a patient. FIG. 2 shows an overall view of an elongate radially expandable tubular stent  13 having a sustained release drug delivery system coated stent surface at a deployed state. As shown in FIG. 2, the stent 13 has its radially outer boundaries 24A, 24B at a deployed state. The interior luminal surface 14, the exterior surface 16, or an entire surface of the stent 13 may be coated or may comprise the sustained release drug delivery system. The interior luminal surface 15 is to contact a body fluid, such as blood in a vascular stenting procedure, while the exterior surface 16 is to contact tissue when the stent 13 is deployed to support and enlarge the biological vessel. The reinforcing wire 17 may be used to maintain the expanded stent at its expanded state as a permanent stent or as a temporary stent. In the case of the surface coated stent 13 functioning as a temporary stent, the reinforcing wire 17 may have the capability to cause collapsing of the expanded stent. The deployment of a stent can be accomplished by a balloon on a delivery catheter or by self-expanding after a pre-stressed stent is released from a delivery catheter. Delivery catheters and methods for deployment of stents are well known to one who is skilled in the art. The expandable stent  13 may be a self-expandable stent, a balloon-expandable stent, or an expandable-retractable stent. The expandable stent may be made of memory coil, mesh material, and the like. Suitable bioabsorbable polymers that could be used include polymers selected from the group consisting of aliphatic polyesters, poly(amino acids), copoly(ether-esters), polyalkylenes oxalates, polyamides, poly(iminocarbonates), polyorthoesters, polyoxaesters, polyamidoesters, polyoxaesters containing amido groups, poly(anhydrides), polyphosphazenes, biomolecules and blends thereof. For the purpose of this invention aliphatic polyesters include homopolymers and copolymers of lactide (which includes lactic acid d-,1- and meso lactide), epsilon.-caprolactone, glycolide (including glycolic acid), hydroxybutyrate, hydroxyvalerate, para-dioxanone, trimethylene carbonate (and its alkyl derivatives), 1,4-dioxepan-2-one, 1,5-dioxepan-2-one, 6,6-dimethyl-1,4-2-one and polymer blends thereof. Poly(iminocarbonate) for the purpose of this invention include as described by Kemnitzer and Kohn, in the Handbook of Biodegradable Polymers, edited by Domb, Kost and Wisemen, Hardwood Academic Press, 1997, pages 251-272. Copoly(ether-esters) for the purpose of this invention include those copolyester-ethers described in Journal of Biomaterials Research, Vol. 22, pages 993-1009, 1988 by Cohn and Younes and Cohn, Polymer Preprints (ACS Division of Polymer Chemistry) Vol. 30(1), page 498, 1989 (e.g. PEO/PLA). Polyalkylene oxalates for the purpose of this invention include U.S. Pat. Nos. 4,208,511; 4,141,087; 4,130,639; 4,140,678; 4,105,034; and 4,205,399 (incorporated by reference herein). Polyphosphazenes, co-, ter- and higher order mixed monomer based polymers made from L-lactide, D,L-lactide, lactic acid, glycolide, glycolic acid, para-dioxanone, trimethylene carbonate and .epsilon.-caprolactone such as are described by Allcock in The Encyclopedia of Polymer Science, Vol. 13, pages 31-41, Wiley Intersciences, John Wiley & Sons, 1988 and by Vandorpe, Schacht, Dejardin and Lemmouchi in the Handbook of Biodegradable Polymers, edited by Domb, Kost and Wisemen, Hardwood Academic Press, 1997, pages 161-182 (which are hereby incorporated by reference herein). Polyanhydrides from diacids of the form HOOC—C 6H4—O—(CH2)m—O—C6H4—COOH where m is an integer in the range of from 2 to 8 and copolymers thereof with aliphatic alpha-omega diacids of up to 12 carbons. Polyoxaesters polyoxaamides and polyoxaesters containing amines and/or amido groups are described in one or more of the following U.S. Pat. Nos. 5,464,929; 5,595,751; 5,597,579; 5,607,687; 5,618,552; 5,620,698; 5,645,850; 5,648,088; 5,698,213 and 5,700,583; (which are incorporated herein by reference). Polyorthoesters such as those described by Heller in Handbook of Biodegradable Polymers, edited by Domb, Kost and Wisemen, Hardwood Academic Press, 1997, pages 99-118 (hereby incorporated herein by reference). Polymeric biomolecules for the purpose of this invention include naturally occurring materials that may be enzymatically degraded in the human body or are hydrolytically unstable in the human body such as fibrin, fibrinogen, collagen, elastin, and absorbable biocompatable polysaccharides such as chitosan, starch, fatty acids (and esters thereof), glucoso-glycans and hyaluronic acid. Suitable biostable polymers with relatively low chronic tissue response, such as polyurethanes, silicones, poly(meth)acrylates, polyesters, polyalkyl oxides (polyethylene oxide), polyvinyl alcohols, polyethylene glycols and polyvinyl pyrrolidone, as well as, hydrogels such as those formed from crosslinked polyvinyl pyrrolidinone and polyesters could also be used. Other polymers could also be used if they can be dissolved, cured or polymerized on the stent. These include polyolefins, polyisobutylene and ethylene-alphaolefin copolymers; acrylic polymers (including methacrylate) and copolymers, vinyl halide polymers and copolymers, such as polyvinyl chloride; polyvinyl ethers, such as polyvinyl methyl ether; polyvinylidene halides such as polyvinylidene fluoride and polyvinylidene chloride; polyacrylonitrile, polyvinyl ketones; polyvinyl aromatics such as polystyrene; polyvinyl esters such as polyvinyl acetate; copolymers of vinyl monomers with each other and olefins, such as ethylene-methyl methacrylate copolymers, acrylonitrile-styrene copolymers, ABS resins and ethylene-vinyl acetate copolymers; polyamides,such as Nylon 66 and polycaprolactam; alkyd resins; polycarbonates; polyoxymethylenes; polyimides; polyethers; epoxy resins, polyurethanes; rayon; rayon-triacetate, cellulose, cellulose acetate, cellulose acetate butyrate; cellophane; cellulose nitreate; cellulose propionate; cellulose ethers (i.e., carboxymethyl cellulose and hydroxyalkyl celluloses); and combinations thereof. Polyamides for the purpose of this application would also include polyamides of the form —NH—(CH 2)n—CO— and NH—(CH2)x—NH—CO—(CH2)y—CO, wherein n is preferably an integer in from 6 to 13; x is an integer in the range of form 6 to 12; and y is an integer in the range of from 4 to 16. The list provided above is illustrative but not limiting. (b) a coating adhered to the surface, said coating comprising a polymer matrix including an anti-neoplastic nucleoside analog, or prodrug thereof, dispersed or dissolved therein. 2. The device of claim 1, wherein the nucleoside analog is a pyrimidine analog. 3. The device of claim 2, wherein the pyrimidine analog is selected from the group consisting of 5-fluorouracil (5FU), 5′-deoxyfluorouridine, fluorouridine, 2′-deoxyfluorouridine, fluorocytosine, trifluoro-methyl-2′-deoxyuridine, arabinosyl cytosine, cyclocytidine, 5-aza-2′-deoxycytidine, arabinosyl-5-azacytosine, 6-azacytidine, N-phosphonoacetyl-L-asparticacid (PALA), pyrazofurin, 6-azauridine, azaribine, thymidine, and 3-deazauridine. 5. The device of claim 1, wherein the nucleoside analog is 5-fluorouracil (5FU) or a prodrug thereof. (b) a coating adhered to the surface, said coating comprising a polymer matrix including a steroid, or prodrug thereof, dispersed or dissolved therein, which steroid has a solubility less than 0.1 mg/mL in water at 25° C.
7. The device of claim 6, wherein the steroid is a corticosteroid. 8. The device of claim 6, wherein the steroid is triamcinolone or a prodrug thereof. 9. The device of claim 6 or 7, wherein the steroid has a solubility less than 0.01 mg/mL in water at 25° C., dispersed or dissolved therein. 10. The device of claim 6 or 7, wherein the steroid has a logP value at least 0.5 logP units more than the logP value for dexamethasone. B represents a moiety which, when linked to A, results in the prodrug having a lower solubility than the therapeutically active form of A. B represents a moiety which, when ionically bonded to A, results in the prodrug having a lower solubility than the therapeutically active form of A. 13. The device of claim 11 or 12, wherein the solubility of the therapeutically active form of A in water is greater than 1 mg/mL and the solubility of the prodrug in water at 25° C. is less than 1 mg/mL. 14. The device of claim 11 or 12, which provides sustained release of the therapeutically active form of A for a period of at least 24 hours, and, over the period of release, the concentration of the prodrug eluting from polymer is less than 10% of the concentration of the therapeutically active form of A. 15. The device of claim 11 or 12, wherein the therapeutically active form of A has a logP value at least 1 logP unit less than the logP value of the prodrug. 16. The device of claim 11 or 12, wherein the solubility of the prodrug is less than 100 μg/ml in water at 25° C.
17. The device of claim 11 or 12, wherein B is a hydrophobic aliphatic moiety. 18. The device of claim 11 or 12, wherein B is a drug moiety having a therapeutically active form generated upon cleavage of said linker L or dissociation of said ionic bond. 19. The device of claim 18, wherein A and B are the same drug moiety. 20. The device of claim 16, wherein A and B are different drug moieties. 21. The device of claim 11 or 12, wherein B, after cleavage from the prodrug, is a biologically or pharmacologically inert moiety. 22. The device of claim 11 or 12, wherein A is selected from immune response modifiers, anti-proliferatives, anti-mitotic agents, anti-platelet agents, platinum coordination complexes, hormones, anticoagulants, fibrinolytic agents, anti-secretory agents, anti-migratory agents, immunosuppressives, angiogenic agents, angiotensin receptor blockers, nitric oxide donors, antisense oligionucleotides and combinations thereof, cell cycle inhibitors, corticosteroids, angiostatic steroids, anti-parasitic drugs, anti-glaucoma drugs, antibiotics, differentiation modulators, antiviral drugs, anticancer drugs and anti-inflammatory drugs. 23. The device of claim 11 or 12, wherein B is selected from immune response modifiers, anti-proliferatives, anti-mitotic agents, anti-platelet agents, platinum coordination complexes, hormones, anticoagulants, fibrinolytic agents, anti-secretory agents, anti-migratory agents, immunosuppressives, angiogenic agents, angiotensin receptor blockers, nitric oxide donors, antisense oligionucleotides and combinations thereof, cell cycle inhibitors, corticosteroids, angiostatic steroids, anti-parasitic drugs, anti-glaucoma drugs, antibiotics, differentiation modulators, antiviral drugs, anticancer drugs, and anti-inflammatory drugs. 24. The device of claim 11 or 12, wherein A is an antineoplastic agent and B is an anti-inflammatory agent. 25. The device of claim 11 or 12, wherein at least one of A or B is an antineoplastic agent. 26. The device of claim 24, wherein said antineoplastic agent is selected from the group consisting of anthracyclines, vinca alkaloids, purine analogs, pyrimidine analogs, inhibitors of pyrimidine biosynthesis, and alkylating agents. 27. 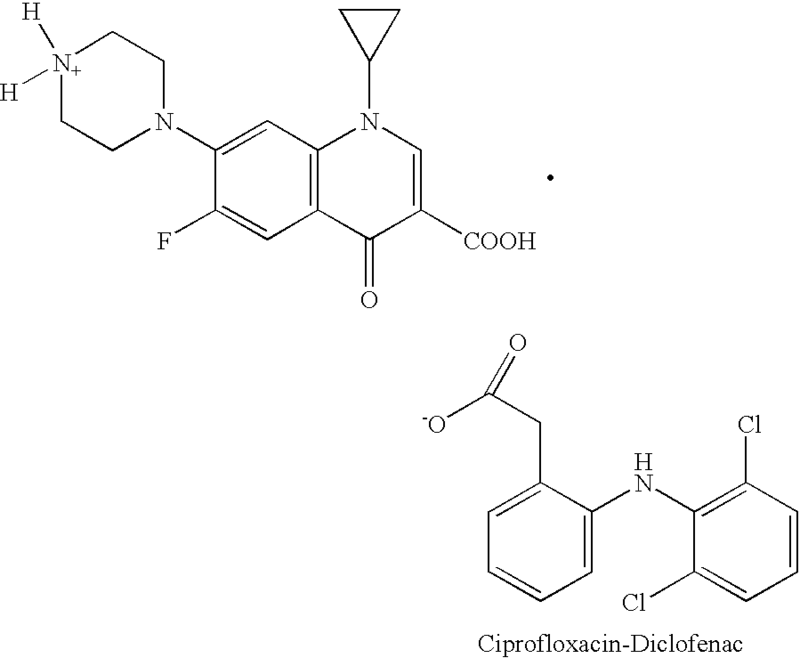 The device of claim 24, wherein said antineoplastic agent is selected from the group consisting of 5-fluorouracil (5FU), 5′-deoxy-5-fluorouridine 5-fluorouridine, 2′-deoxy-5-fluorouridine, fluorocytosine, 5-trifluoromethyl-2′-deoxyuridine, arabinoxyl cytosine, cyclocytidine, 5-aza-2′-deoxycytidine, arabinosyl 5-azacytosine, 6-azacytidine, N-phosphonoacetyl-L-aspartic acid, pyrazofurin, 6-azauridine, azaribine, and 3-deazauridine. 28. The device of claim 24, wherein said antineoplastic agent is selected from the group consisting of cladribine, 6-mercaptopurine, pentostatin, 6-thioguanine, and fludarabin phosphate. 29. The device of claim 24, wherein said antineoplastic agent is a pyrimidine analog. 30. The device of claim 28, wherein said pyrimidine analog is selected from the group consisting of arabinosyl cytosine, cyclocytidine, 5-aza-2′-deoxycytidine, arabinosyl 5-azacytosine and 6-azacytidine. 31. 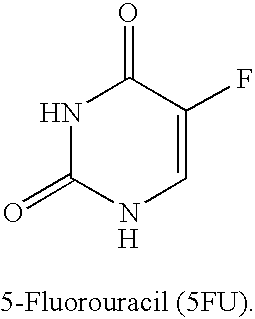 The device of claim 29, wherein the pyrimidine analog is selected from the group consisting of 5-fluorouracil (5FU), 5′-deoxyfluorouridine, fluorouridine, 2′-deoxyfluorouridine, fluorocytosine, trifluoro-methyl-2′-deoxyuridine, arabinosyl cytosine, cyclocytidine, 5-aza-2′-deoxycytidine, arabinosyl-5-azacytosine, 6-azacytidine, N-phosphonoacetyl-L-asparticacid (PALA), pyrazofurin, 6-azauridine, azaribine, thymidine and 3-deazauridine. 33. The device of claim 32, wherein the nucleoside analog is 5-fluorouracil (5FU) or a prodrug thereof. 34. The device of claim 11, 12 or 24, wherein at least one of A or B is steroid. 35. The device of claim 34, wherein the steroid is a corticosteroid. 36. The device of claim 34, wherein the steroid has a solubility less than 0.1 mg/mL in water at 25° C., dispersed or dissolved therein. 37. The device of claim 34, wherein the steroid has a logP value at least 0.5 logP units more than the logP value for dexamethasone. 38. 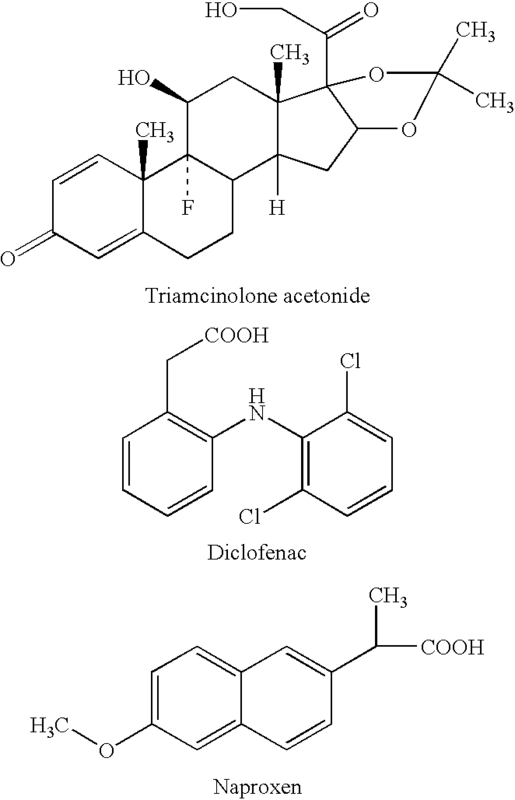 The device of claim 34, wherein the steroid is triamcinolone or a prodrug thereof. 39. The device of claim 11 or 12, wherein A is a fluorinated pyrimidine and B is a corticosteroid. 40. The device of claim 11 or 12, wherein A is 5-fluorouracil and B is triamcinolone acetonide. 41. The device of claim 11 or 12, wherein the linkage L is hydrolyzed in bodily fluid. 42. The device of claim 41, wherein the linkage L includes one or more hydrolyzable groups selected from the group consisting of an ester, an amide, a carbamate, a carbonate, a cyclic ketal, a thioester, a thioamide, a thiocarbamate, a thiocarbonate, a xanthate and a phosphate ester. 43. The device of claim 11 or 12, wherein the linkage L is enzymatically cleaved. 44. The device of any of claims 1, 2, 11 or 12, wherein the polymer is non-bioerodible. 45. The device of claim 44, wherein the non-bioerodible polymer is selected from polyurethane, polysilicone, poly(ethylene-co-vinyl acetate), polyvinyl alcohol, and derivatives and copolymers thereof. 46. The device of claim 1, 2, 11 or 12, wherein the polymer is bioerodible. 47. The device of claim 46, wherein the bioerodible polymer is selected from polyanhydride, polylactic acid, polyglycolic acid, polyorthoester, polyalkylcyanoacrylate and derivatives and copolymers thereof. 48. The device of claim 1, 2, 11 or 12, wherein the substrate is a surgical implement selected from a screw, a plate, a washer, a suture, a prosthesis anchor, a tack, a staple, an electrical lead, a valve, a membrane, an anastomosis device, a vertegral disk, a bone pin, a suture anchor, a hemostatic barrier, a clamp, a clip, a vascular implant, a tissue adhesive or sealant, a tissue scaffold, a bone substitute, an intraluminal device and a vascular support. 49. The device of claim 1, 2, 11 or 12, selected from the group consisting of catheters, implantable vascular access ports, blood storage bags, blood tubing, central venous catheters, arterial catheters, vascular grafts, intraaortic balloon pumps, heart valves, cardiovascular sutures, artificial hearts, a pacemaker, ventricular assist pumps, extracorporeal devices, blood filters, hemodialysis units, hemoperfusion units, plasmapheresis units, filters adapted for deployment in a blood vessel, intraocular lenses, shunts for hydrocephalus, dialysis grafts, colostomy bag attachment devices, ear drainage tubes, leads for pace makers and implantable defibrillators, and osteointegrated orthopedic devices. 50. The device of claim 1, 2, 11 or 12, which is a vascular stent. 51. The device of claim 50, which is an expandable stent, and said coating is flexible to accommodate compressed and expanded states of said expandable stent. 52. The device of claim 1, 2, 11 or 12, wherein the weight of the coating attributable to the drug is in the range of about 0.05 mg to about 10 mg of drug per cm2 of the surface coated with said polymer matrix. 53. The device of claim 1, 2, 11 or 12, wherein the coating has a thickness is in the range of 5 micrometers to 100 micrometers. 54. The device of claim 1, 2, 11 or 12, wherein drug is present in an amount between 5% and 70% by weight of the coating. 55. A stent having at least a portion which is insertable or implantable into the body of a patient, wherein the portion has a surface which is adapted for exposure to body tissue and wherein at least a part of the surface is covered with a coating for releasing at least one biologically active material, the coating comprising a polymer matrix having an antineoplastic nucleoside analog, or prodrug thereof, dispersed or dissolved therein. 56. A stent having at least a portion which is insertable or implantable into the body of a patient, wherein the portion has a surface which is adapted for exposure to body tissue and wherein at least a part of the surface is covered with a coating for releasing at least one biologically active material, the coating comprising a polymer matrix having a steroid dispersed or dissolved therein, which steroid has a solubility less than 0.1 mg/mL in water at 25° C.
59. An intraluminal medical device coated with a sustained release system comprising a biologically tolerated polymer and a low-solubility prodrug dispersed in the polymer, said device having an interior surface and an exterior surface; said device having said system applied to at least a part of the interior surface, the exterior surface, or both. wherein said matrix further comprises a semi-permeable lattice having intermittent pores with cross sectional area sufficient to restrict the passage of moiety A but to allow the passage of moiety B. 62. The device of claim 61, wherein said lattice is bioerodible. 63. The device of claim 61, which provides sustained release of moiety A for a period of at least 24 hours, and, over the period of release, the concentration of moiety A in fluid outside the polymer is less than 10% of the concentration of moiety B in said fluid. 64. The device of claim 61, wherein the substrate is a surgical implement selected from a screw, a plate, a washer, a suture, a prosthesis anchor, a tack, a staple, an electrical lead, a valve, a membrane, an anastomosis device, a vertegral disk, a bone pin, a suture anchor, a hemostatic barrier, a clamp, a clip, a vascular implant, a tissue adhesive or sealant, a tissue scaffold, a bone substitute, an intraluminal device and a vascular support. 65. The device of claim 61, selected from the group consisting of catheters, implantable vascular access ports, blood storage bags, blood tubing, central venous catheters, arterial catheters, vascular grafts, intraaortic balloon pumps, heart valves, cardiovascular sutures, artificial hearts, a pacemaker, ventricular assist pumps, extracorporeal devices, blood filters, hemodialysis units, hemoperfusion units, plasmapheresis units, filters adapted for deployment in a blood vessel, intraocular lenses, shunts for hydrocephalus, dialysis grafts, colostomy bag attachment devices, ear drainage tubes, leads for pace makers and implantable defibrillators, and osteointegrated orthopedic devices. 66. The device of claim 61, which is a vascular stent. wherein the solubility of therapeutically active form of A in water is greater than 1 mg/ml and the solubility of the prodrug in water is less than 1 mg/ml. wherein, when disposed in biological fluid, said sustained release formulation provides sustained release of the therapeutically active form of A for a period of at least 24 hours, and, over the period of release, the concentration of the prodrug in fluid outside the polymer is less than 10% of the concentration of the therapeutically active form of A. 71. The coating of any one of claims 67-70, wherein A and B are the same drug moiety. 72. The coating of any one of claims 67-70, wherein A and B are different drug moieties. 73. The coating of any one of claims 67-70, wherein B, after cleavage from the prodrug, is a biologically inert moiety. 74. The coating of any one of claims 67-70, wherein A is selected from immune response modifiers, anti-proliferatives, anti-mitotic agents, anti-platelet agents, platinum coordination complexes, hormones, anticoagulants, fibrinolytic agents, anti-secretory agents, anti-migratory agents, immunosuppressives, angiogenic agents, angiotensin receptor blockers, nitric oxide donors, antisense oligionucleotides and combinations thereof, cell cycle inhibitors, corticosteroids, angiostatic steroids, anti-parasitic drugs, anti-glaucoma drugs, antibiotics, differentiation modulators, antiviral drugs, anticancer drugs, and anti-inflammatory drugs. 75. The coating of any one of claims 67-70, wherein B is selected from immune response modifiers, anti-proliferatives, anti-mitotic agents, anti-platelet agents, platinum coordination complexes, hormones, anticoagulants, fibrinolytic agents, anti-secretory agents, anti-migratory agents, immunosuppressives, angiogenic agents, angiotensin receptor blockers, nitric oxide donors, antisense oligionucleotides and combinations thereof, cell cycle inhibitors, corticosteroids, angiostatic steroids, anti-parasitic drugs, anti-glaucoma drugs, antibiotics, differentiation modulators, antiviral drugs, anticancer drugs, and anti-inflammatory drugs. 76. The coating of any one of claims 67-70, wherein the duration of release of the therapeutically active form of A from the polymer matrix is at least 24 hours. 77. The coating of any one of claims 67-70, wherein A is 5-fluorouracil (5FU) and B is a steroid. 78. The coating of any one of claims 67-70, wherein at least one of A or B is an antineoplastic agent. 79. The coating of any one of claims 67-70, wherein said antineoplastic agent selected from the group consisting of anthracyclines, vinca alkaloids, purine analogs, pyrimidine analogs, inhibitors of pyrimidine biosynthesis, and alkylating agents. 80. The coating of any one of claims 67-70, wherein said antineoplastic drug is a fluorinated pyrimidine. 81. 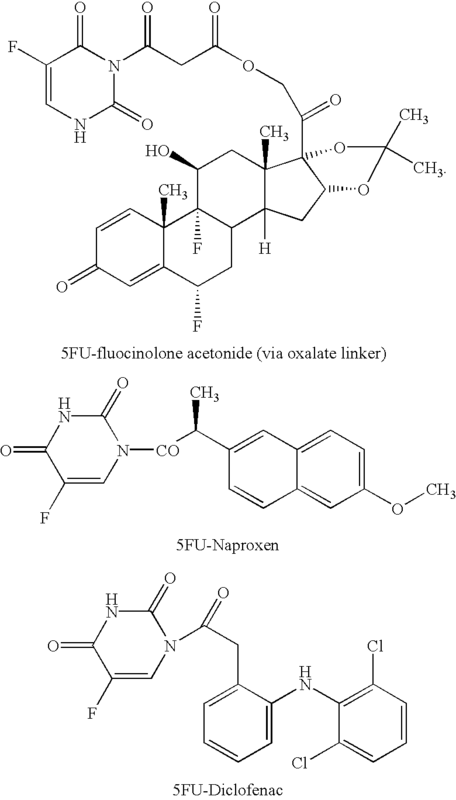 The coating of any one of claims 67-70, wherein said antineoplastic drug is selected from the group consisting of 5-fluorouracil (5FU), 5′-deoxy-5-fluorouridine 5-fluorouridine, 2′-deoxy-5-fluorouridine, fluorocytosine, 5-trifluoromethyl-2′-deoxyuridine, arabinoxyl cytosine, cyclocytidine, 5-aza-2′-deoxycytidine, arabinosyl 5-azacytosine, 6-azacytidine, N-phosphonoacetyl-L-aspartic acid, pyrazofurin, 6-azauridine, azaribine, and 3-deazauridine. 82. The coating of any one of claims 67-70, wherein said antineoplastic drug is a pyrimidine nucleoside analog selected from the group consisting of arabinosyl cytosine, cyclocytidine, 5-aza-2′-deoxycytidine, arabinosyl 5-azacytosine, and 6-azacytidine. 83. The coating of any one of claims 67-70, wherein said antineoplastic drug is selected from the group consisting of cladribine, 6-mercaptopurine, pentostatin, 6-thioguanine, and fludarabin phosphate. 84. The coating of any one of claims 67-70, wherein the therapeutically active form of A is 5-fluorouracil. 85. The coating of any one of claims 67-70, wherein at least one of A or B is an anti-inflammatory agent. 86. The coating of claim 85, wherein said anti-inflammatory agent is a non-steroidal anti-inflammatory. 87. The coating of claim 85, wherein anti-inflammatory agent is a glucocorticoid. 88. The coating of claim 87, wherein said glucocorticoid is selected from the group consisting of aclometasone, beclomethasone, betamethasone, budesonide, clobetasol, clobetasone, cortisone, desonide, desoximetasone, diflorosane, flumethasone, flunisolide, fluocinolone acetonide, fluocinolone, fluocortolone, fluprednidene, flurandrenolide, fluticasone, hydrocortisone, methylprednisolone aceponate, mometasone furdate, prednisolone, prednisone and rofleponide. 89. The coating of any one of claims 67-70, wherein the therapeutically active form of B is selected from fluocinolone acetonide, triamcinolone acetonide, diclofenac, and naproxen. 90. The coating of any one of claims 67-70, wherein the prodrug, in its linked form, has an ED50 for producing said clinical response at least 10 times greater than the ED50 of the therapeutically active form of A. 91. The coating of any one of claims 67-70, wherein the polymer is non-bioerodible. 92. The coating of any one of claims 67-70, wherein the polymer is bioerodible. 93. The coating of any one of claims 67-70, wherein A is 5-fluorouracil (5FU) or triamcinolone (TA). 95. The device of claim 94, wherein said lattice is bioerodible. 96. The device of claim 94, which provides sustained release of moiety A for a period of at least 24 hours, and, over the period of release, the concentration of moiety A in fluid outside the polymer is less than 10% of the concentration of moiety B in said fluid. 97. The device of claim 94, wherein the substrate is a surgical implement selected from a screw, a plate, a washer, a suture, a prosthesis anchor, a tack, a staple, an electrical lead, a valve, a membrane, an anastomosis device, a vertegral disk, a bone pin, a suture anchor, a hemostatic barrier, a clamp, a clip, a vascular implant, a tissue adhesive or sealant, a tissue scaffold, a bone substitute, an intraluminal device and a vascular support. ES2272896T3 (en) 2007-05-01 coated medical devices for the treatment of vascular disease.